Let's get straight to the point: Alex Beyrodt's Voodoo Circle is a must buy. 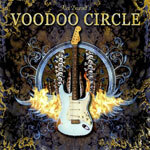 There's been boatload of great melodic rock and metal in 2008, and 'Voodoo Circle' has got to be in the top five at the least. Silent Force's master axeman Alex Beyrodt has assembled an all star lineup of supergroup caliber for his first musical adventure: David Readman (Pink Cream 69) on lead vocals, former bandmate Mat Sinner on bass, Mel Gaynor (Gary Moore) on drums and keyboard magician, Jimmy Kresic. If that's not enough to get your melodic blood pumping, Mr. Beyrodt enlists more musical muscle in guest spots: Doogie White (Yngwie Malmsteen), Rudy Sarzo (Whitesnake), Norifumi Shima (Concerto Moon) and Richard Andersson (Majestic, Space Odyssey). Oh, and by the way, Dennis Ward did the mix. Did I mention Alex Beyrodt really rips it up on this disc? Did I mention that you should buy this work immediately? Why are you still reading this? Some would blow this musical masterpiece off as another outlet for some guitar whiz to wiggle about his fret board and impress us all. Sure, as expected, Beyrodt does clever and ingenious things on this album. However, this album works because these are well-composed songs performed exquisitely by accomplished musicians. Beyrodt may be the point man, but it's the song and band that are the real stars here. And this is a true compliment to Alex Beyrodt: gifted as he may be, he knows he shines best when polished with help of many helpful hands. Alex Beyrodt's Voodoo Circle is a true gem, nearly flawless (a bit of repetition towards the end, but hardly consequential) in composition and beauty. It's an album of melodic hard rock and metal you'll enjoy from first song to last and, more importantly, remember as a genuine masterpiece. Alex Beyrodt's Voodoo Circle is a true gem, nearly flawless in composition and beauty. It's an album of melodic hard rock and metal you'll enjoy from first song to last and, more importantly, remember as a genuine masterpiece.